In 2019 CHEAP is issuing its seventh CALL for ARTISTS, targeting not only street artists but anyone involved in graphic design, photography, illustration and visual art more generally. The pieces applicants send in a digital format will be printed and pasted up on the CHEAP On Board circuit of bulletin boards in downtown Bologna. For CHEAP, this open call has always represented a key element of its identity: it enables the hybridization of languages, breaks down geographical borders, launches a collective discussion, investigates contemporary issues from the bottom up and seeks to reassemble individual statements into a collective narrative. Sabotage – verb UK /ˈsæb.ə.tɑːʒ/ US /ˈsæb.ə.tɑːʒ/ Deliberately destroy, damage, or obstruct (something), especially for political or military advantage. It’s no wonder that the first definition for sabotage is crime. But we know that for anyone throughout history who has fought against occupation, dictatorships and segregation, sabotage is a practice of resistance. And another such practice is hacking, aimed at creatively accessing a system, understanding how it works and sharing that knowledge in an open source format. On the other hand, in the physical and public space of the streets we have turned to adbusting, we have adopted practices of unexpected détournement with the power to defuse advertising ideologies through more or less artistic tampering. For 2019, CHEAP is heading back out on the streets with your posters and we are asking you to re-imagine yourselves as saboteurs: think of it as an open invitation to semiotic guerrilla warfare. We are calling on you to produce new signs, to create and recreate meaning, to demystify with style: to forge connections and pose challenges, to sabotage and subvert. Be contradictory: present us with new forms of inference, chart new narrative routes, produce new partialities. Be critical: unexpectedly redefine the order in your own surroundings, reinterpret your worlds, perform an act of collective hacking that breathes new life into the existing aesthetic paradigm. What we are looking for is a response from the bottom up: overturn, manipulate, shake up and subvert codes, create short circuits. Change our collective course. Engage in sabotage. And do it with a poster. The call is open to anyone who would like to propose a poster art project. It is free to participate and applicants can take part individually or as a group; collectives will be treated as individual persons. Each individual or group may propose up to three projects, which must be received by the Festival organizers no later than midnight (Italian time) on May the 10th, 2019. The artwork must be inserted (together with a completed and signed Registration Form, which can be downloaded from the website in a folder with the name of the individual artist or collective. The folder should be sent to artisti@cheapfestival.it using regular email or a file sharing program. If you use an artist name, please indicate it on the registration form and in the name of the folder. The pieces can be created using any of the following techniques: vector graphics, illustration, photography and/or collage. Each applicant is welcome to send up to 3 posters (pieces). The posters must be exclusively in black and white (including the entire grey scale). All files must be in .pdf or .jpg format. The poster must be a maximum of 70×100 cm (vertical) or 100×70 cm (horizontal) with a minimum resolution of 300 dpi. Each file must be named as follows: number of the image, name of the artist, measurements. To help you, there is a folder (PSD_POSTER) you can download HERE containing two files that are already sized 70x100cm and 100x70cm, in .psd format. USE THESE TWO FILES AS TEMPLATES for your vertical or horizontal posters. All you need to do is paste your piece onto the grey layer named IMMAGINE and write your first and last name or artist name in the text layer named NOME/NAME, then save the file as a .pdf or .jpg and name it as indicated above. These files include a locked layer named CHEAP, please do not delete or cover this layer. The organizers of CHEAP reserve the right to select pieces that display originality as well as marked aesthetic and communicative qualities. Any pieces received after the deadline and/or that fail to follow the technical specifications outlined above will be excluded. 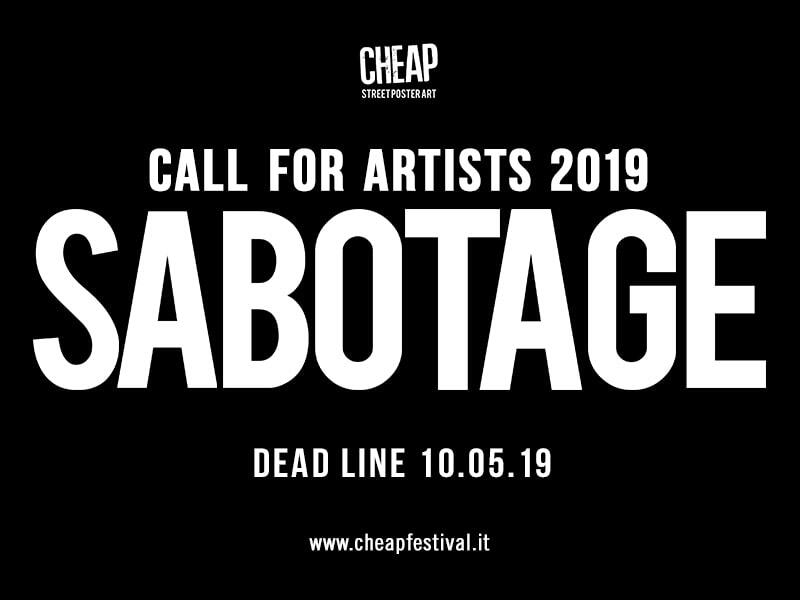 The festival will announce which projects have been selected within 20 days of the end of the open call by publishing the names of selected artists in a special section of the www.cheapfestival.it site. The selected projects will be printed at the Festival’s expense and hung up in specific parts of the city of Bologna for the duration of the Festival. The authors of individual projects are the exclusive holders of ownership rights associated with the artwork, the originality of which they personally vouch for. By participating in the open call, the artists also implicitly agree to the rules of the call, specifically, that the artwork will be temporary displayed in an urban space and used by the organizers to promote the non-profit activities of the CHEAP association. Premio per il Contemporaneo Renner Italia | dal 30 gennaio al 3 febbraio a Bologna per Art City	(IT) UR-FASCISMO: lo sappiamo riconoscere?